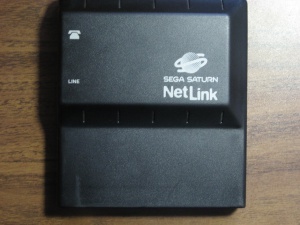 The Netlink is essentially a stripped down modem used by about a dozen games to do multiplayer over a telephone line. It was only released in North America and supposedly a limited release in Europe. The hardware itself is based on the RC288DPi Rev 05BA chipset by Rockwell(who are Conexant now). Maximum connection speed is 28800 bps. There was also a web browser that came with it called Planetweb. For the most part it's accessed pretty much the same as a regular PC modem, with a few odd exceptions. It's mapped on the A-bus CS2 area along with the CD block(it's pretty much mapped every area the cd block isn't). For the sake of simplicity, here's a list of the addresses used by developers. The X-Band Modem has the same set of registers, but they appear to be mapped at 0x25895021-0x25895039 instead. Normally, to use it, you first have to send command 0xA to the SMPC. This "turns on" the modem. After that, it's best to write a byte to the Scratch Register, then read it again afterwards to make sure it is indeed on. In order to initialize the Netlink, the SMPC has to turn it on via SMPC command 0xA. After that, the SCR register should be written to and read to verify that it's working correctly. You may also want to setup a separate buffer to buffer data from the receive buffer. This page was last modified on 19 September 2010, at 22:47.